The basic attitude of the world community is that there was very little economic growth before 1800 AD. Even if one accepts the idea, one would still have to admit that England was already a wealthy country in 1700 AD – and thus one wonders about Renaissance Florence, Medieval Regensburg, Charlemagne’s Aix-la-Chapelle, Imperial Rome, Hellenistic Alexandria, Classical Athens, Hammurabi’s Babylon, Egyptian Memphis, Akkadian Agade, Uruk, etc. And that is only the Western story: what about Beijing, Hangzhou, Mohenjo-Daro, etc.? Where does one draw the line? Obviously, economic growth began at some point, for all of these historical developments are part of a tale which began earlier still. But equally obviously, the economic growth of the West in the 19th and 20th centuries was unparalleled and almost unrelated to what we know of ancient civilisations. Thus, the question arises as to what we can say about economic growth (as opposed to economic activity) before the recent outbreak. This leads to several different sets of questions. On the one hand, we must ask about the How? What happened? When? Where? Why is it significant? What is relevant? Is economic development always an urban phenomenon linked to a civilisation which breaks free of the constraints of the agricultural sector? And, what, therefore is the role of agriculture in national income and employment? Furthermore, we must ask about the phenomenon itself. Where did economic growth begin? How do you define it? What pushes it? What contributes to it? 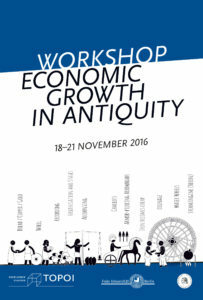 Can you measure or quantify economic growth in Antiquity in a meaningful fashion? What characterises economic growth? What does it mean? What impedes economic growth? Can one separate inequality and economic growth? And this leads to the most paradoxical of all questions? What does economic stagnation mean? For the modern western world, 1% annual growth is considered disappointing. And yet there can hardly have been very many polities that came anywhere near that rate even at the most accelerated pace of economic growth known from the pre-modern world. And thus – what are we judging and how? And finally, on the other hand comes the question of just how meaningful economic growth is. Why are we (as a society) accustomed to aiming for economic growth and using it as a measuring stick against which to rate progress? What else should one measure? And are other measures not actually reflections of, or proxies for, economic growth? How important is economic growth? In this workshop, we will try to confront what we have in the way of evidence with these and other questions. From Babylon to Bernanke: What was Critical, When, and Why? SUMER: Can Economic Growth be Detected and Quanti ed during the Third Millennium - and if so How? EGYPT: Usage of Proxy Data for Middle Kingdom Economy: Indications for Economic Growth?